← The Adorables album is out today! This is an instrument for users of M4L and fans of Game of Thrones. 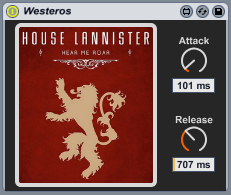 It is essentially a sample pack of animal sounds that you select by scrolling through a few sigils of Westeros. I’ll make a standalone application soon for anyone who doesn’t use M4L.